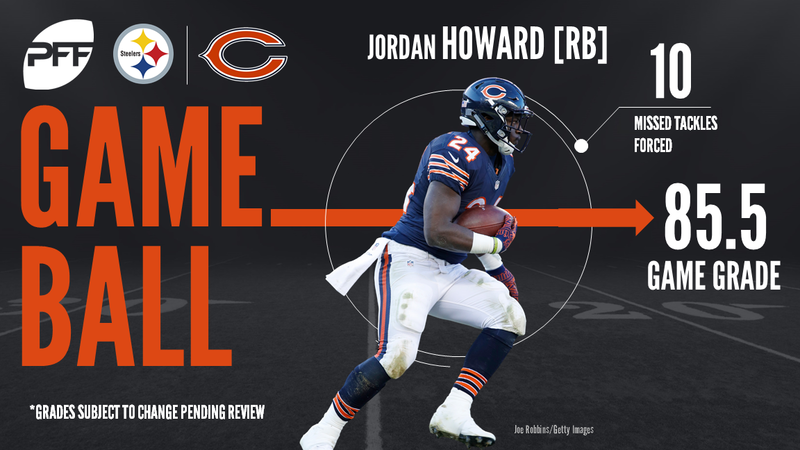 RB Jordan Howard opened and closed the scoring with a rushing touchdown against the Pittsburgh Steelers, jumping the Bears out to an early lead. The Steelers would tie the game with a WR Antonio Brown touchdown catch but the Bears stretched their halftime lead to 17-7 with a TE Adam Shaheen touchdown catch from QB Mike Glennon and a field goal. The Steelers would storm back to tie the game and force it into overtime, partially due to a RB Le’Veon Bell touchdown score, before Howard would scamper in on the game’s final play to give Chicago a 23-17 OT victory. With that, we give you our PFF exclusive takeaways from the contest for each team. After a very slow start to the season, Howard bounced back in a massive way in this game. He rushed for 138 yards on 22 carries, including 65 of them coming after contact. He added two touchdowns, including the game-winner, and also forced a ridiculous 10 missed tackles. That all works out to a top-notch elusive rating of 100.9 for the game for Howard. Glennon was a checkdown machine in this game, and while the Bears clearly based their offensive attack around the run game this week it was still tough watching Glennon refuse to look downfield. He attempted just four passes that travelled at least 10 yards in the air and completed only one for 17 yards. While this was a win for the Bears, Glennon’s lack of an intermediate or deep game could be a cause for concern for the Bears as the season rolls on. This was a very impressive game for the Bears’ defense, especially for Amukarama. He was targeted just three times in the game and allowed one catch for seven yards. While that catch was a touchdown to Antonio Brown, Amukamara had great coverage on the play and was just beaten by a great catch by Brown. He broke up the other two passes thrown his way and also had a stop on another pass play that led to a third and long. Callahan also had a big day in the secondary for the Bears, but for different reasons. That’s not to say he wasn’t strong in coverage. He was targeted just four times in 27 coverage snaps, and allowed three catches for 21 yards. He made one big third down stop as well. Callahan also recorded a strip sack on Roethlisberger which killed a drive early in the game and let the Steelers know that this defense wasn’t going to roll over for them. While much of the Steelers offense struggled in this game, Brown was his usual dominant self against this Bears defense. He saw a game-high 14 targets and hauled in 10 of them for 110 yards and a touchdown. That worked out to a very impressive average of 2.56 yards per route run. He also forced a missed tackle, which gives him six missed tackles forced through three games. It hasn’t exactly been the most dominant start from Roethlisberger, who has played decidedly average through the first three games of the Steelers season thus far. He attacked downfield often but didn’t find a ton of success there, going just 8-for-23 on passes more than 10 yards downfield for 122 yards and some dangerous throws that could’ve been intercepted. He wasn’t under pressure often (8 dropbacks out of 43) but went just 2-of-5 for 22 yards when he was. Burns’ overpursuit on Jordan Howard’s game winning TD might have looked bad for him, but until that play he was having a fantastic game. Burns was targeted just twice and allowed one catch for zero yards. His tight coverage caused the other incompletion and he broke up another pass despite not being in coverage, just making a fantastic reaction play. His 24.0 coverage snaps per reception allowed is a very good number, and his 0.00 yards per route run allowed is unlikely to be beaten by any corner this week.